For the past few months, people all over the country have been talking about one thing that affects all of us - load shedding. Load shedding is a way of saving electricity. It means electricity is switched off in certain areas for periods of about two hours at a time. This helps to ensure that the electricity that is available is enough for everyone. But load shedding is not the only way of saving energy. 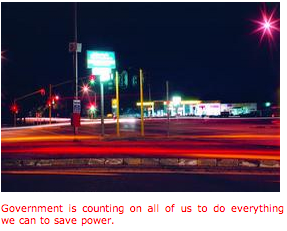 We must all work with government to save electricity. If we use more electricity than what is available, it could lead to more power cuts for longer periods across the country. If all of us put in an effort and use the electricity saving tips that are available, we can save more than 10 per cent of the country's total electricity usage. Government, through the Department of Minerals and Energy, has started a National Response Plan to reduce the use of electricity. If it is successful, it may put an end to load shedding. The plan is already in place and involves saving electricity in government and state-owned buildings. 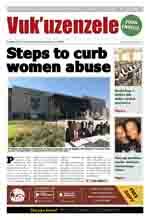 These buildings include hospitals, municipal offices, clinics and Eskom buildings. It also includes 2010 projects and traffic lights. Through the response plan, government is educating people to save electricity and encouraging them to change their behaviour. The response plan is expected to help solve the electricity problem in the next five to eight years. Government has also come up with energy regulations. 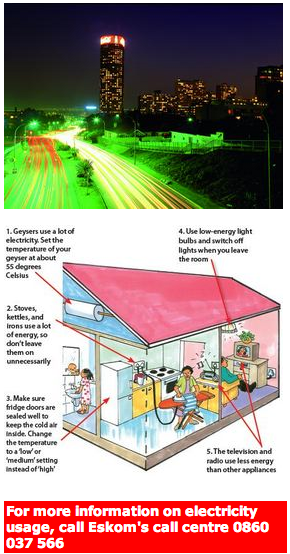 In line with the regulations, lights may not be on in empty buildings, especially after working hours, street lights and lights on highways may not be switched on during the day and government buildings or projects may use only energy-saving light bulbs. Electric geysers in new houses with a value above R750 000 and in office blocks, hostels, resorts and shopping complexes must have solar water-heating abilities. Turn off your computer, TV, or radio when you're not using it. As the country continues with efforts to save energy, it is important to know how much electricity your appliances use at home. An electricity usage leaflet from Eskom gives details about electrical appliances at home and how much electricity they use. Stoves, geysers, kettles, washing machines, heaters, fans, dishwashing machines and grinding machines, use the most electricity. They are followed by microwave ovens, frying pans and irons. Home appliances that use less electricity are hi-fis, televisions, radios, electric blankets and light bulbs. When you buy your appliances you will see the number of watts (units of electrical power) that it uses. This number is usually stamped under or at the back of your appliance. An iron, for example, uses 1 500 watts. This is equal to 1, 5 kilowatts (a kilowatt is 1 000 watts of electricity). To change watts to kilowatts, move the comma three spaces to the left, for example: 1 500 watts = 1, 5 kilowatts. To find out what it costs, you then multiply the number of kilowatts by the price of one unit of electricity, for example 40 cents (1, 5 x 40 cents = 60 cents). This is the cost of using an iron for an hour. South Africa is finding itself in a position where the need for electricity is more than the available supply. By working together to save electricity, we are helping government to make sure that there will be enough to go around. Energy-saving plans are already cutting the demand for electricity. But saving energy now is a short-term solution to the problem. For this reason, government has started major long-term plans to solve the country's electricity problems into the future. Over the next five years alone, government, through the national electricity supplier, Eskom, plans to spend about R300 billion. The long-term plans consist of different types of power stations using modern technology to make more energy. This includes a pressure water reactor, which will be ready by 2015. It is a way of creating energy by using boiling water that is put under pressure. In Cape Town, government is also building a wind-energy power station. This is a way of making electricity from wind energy using windmills. It will create about 100 megawatts of power for the area. Another project is the building of an energy source known as a pebble bed modular reactor. It is expected to start making energy before 2013. About half of the 40 000 megawatts of power needed by the country over the next 20 years will come from nuclear power. South Africa is not the only country in the world that is facing energy shortages. Many other developing countries are finding that they cannot keep up with the electricity demand. Brazil has also faced similar problems. The Brazilian government managed to solve its electricity problems with the help of its people. Households that wasted electricity had to pay fines, while those which saved were awarded. Our government will not follow Brazil's example in this regard, but is counting on all of us to do everything we can to save electricity.